Welcome, fellow jewelry making friends! This is the fifth issue of the Making-Jewelry e’Zine. More than 500 of you have subscribed so far, so a big "Thanks" to all of you for subscribing and showing an interest in my jewelry making website and newsletter! In my hometown of Portland, Oregon it's been getting wet and cold outside. 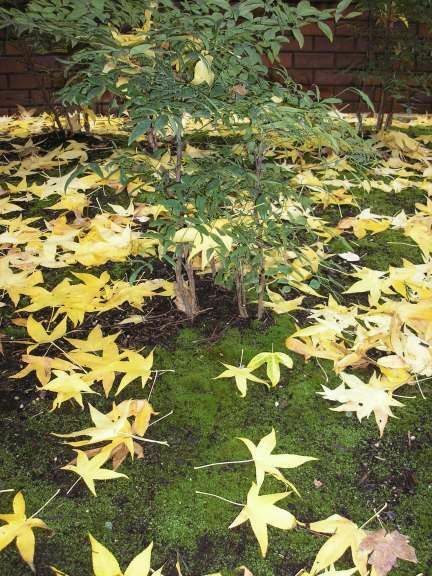 I hope you are enjoying the changing seasons, wherever you live. There are still some leaves on the trees, providing inspiration for more autumn colored jewelry. I've been really busy and I know things will get even more hectic in the months to come. Consider starting your holiday jewelry gift projects now! If you need some income for the holidays, making your own jewelry and selling it at craft fairs, home parties, or even just to friends and family is always a great idea. 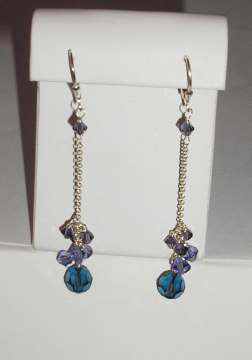 Listed below are the new jewelry designs just added to the site. November's modern birthstone is the topaz. Topaz is popular in amber/gold colors, as well as blue, but it actually comes in several colors ranging from colorless, to blue, pink, orange, red, champagne, sherry-brown, brown and yellow. Topaz is rated 8 on the Moh's hardness scale, making is a durable gemstone that is popular in rings and other jewelry. Try pairing golden topaz with purple for an awesome color combination. 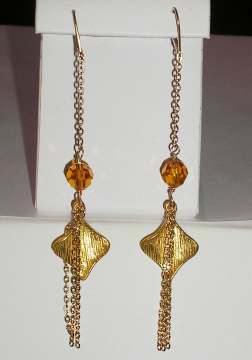 Topaz also looks great with gold, so be sure to check the new gold fan earrings I just added to the site. Looking for special deals to save some money on jewelry making supplies? Here is what I have scouted out for you this month! Beadshop.com is offering a web coupon until 11/21. Get 15-30% off your order. FoxyFindings sells on eBay auctions, as well as directly from their website. Foxy Findings is a great source of vintage-look findings and castings made from brass and other metals. 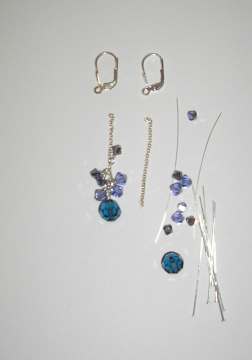 FoxyFindings is also a great place for jewelry kits if you are having a little trouble coming up with a fresh idea. To use the FoxyFindings.com Discount offer, enter the code FOXY at checkout and receive 15% off your total order. Auntie’s Beads - Auntie's is always having a sale on something, so be sure to check out their website specials. Enter code GIVEME5 to get 5% off a hundred dollar order. Here is the newsletter-subscribers-only project design idea of the month, sent to you because you are an exclusive member of my e’zine newsletter. Cost: Varies, depending on materials selected. Approximately $10-20 as shown. 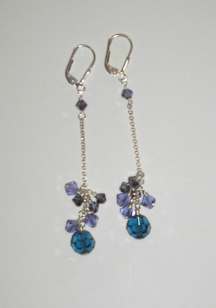 Here, the ever-popular Swarovski crystal beads in multiple blue colors are swinging from chain in a cluster. Choose any color combination and size/shape of crystal beads for your own unique design variation. 16 Swarovski crystal beads in your choice of colors, shapes and sizes. I used blue colors in my design. Add more crystals if you like! Assemble all of your crystal beads, slide them onto headpins, and make a loop at the top with your round nose pliers. If you need help learning how to do wire loops, follow these step by step instructions. 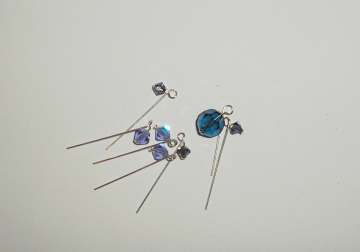 To start assembling the earrings, we will start with the bottom crystal bead. Attach it to the bottom of the chain, and close it with a closed wire loop. Next, attach the smaller crystals at different positions along the chain. You will attach all of the crystals, with closed wire loops, except the top two crystals. Cut a few inches of silver wire. Use your round nose pliers to create a basic loop. If you need help learning how to do wire loops, follow these step by step instructions. Attach the loop to the chain and make a closed wire loop. Slide the crystal onto the wire and make another loop. Attach the top loop to the earring component, and close it. Make the second earring the same way, and that's it! Enjoy your new swingy earrings! Did you know you can turn your fun hobby of making jewelry into a great business? There are two fantastic online eBooks available if you are interested in turning your fun jewelry hobby into a nice income stream. Why not earn some extra spending money for the holidays by making and selling some of your own designs? It's fun and with a little know-how, it can be quite easy to get started. The best part is an eBook is downloadable right from the web, so you can be reading your new book and learning how to sell your own jewelry within minutes. For those of you who have already purchased my ebook on how to run a home jewelry party business, How to Run a Home Based Jewelry Party Business for Fun and Profit"--THANK YOU! It's great to share my knowledge and experience with you. Your feedback and comments on the book are always appreciated. If you are interested in running your own jewelry party business and working from home, check out my website for more information on how to get your copy of this great book, "How to Run a Home Based Jewelry Party Business for Fun and Profit". It's holiday craft fair season! If you are planning to sell any jewelry at craft fairs, you will definitely want to check out this book! Last month I reviewed a brand new jewelry business book, the Ultimate Guide to Your Profitable Jewelry Booth. This excellent guide is written by Rena Klingenberg, a successful jewelry artist and business owner. Rena is also the creator and owner of www.home-jewelry-business-success-tips.com. Rena has compiled her years of experience in selling jewelry at craft fairs and shows into one awesome book. If you want to venture into selling your own jewelry and becoming more profitable--check out her book, because you will definitely learn many practical ways to increase sales and improve your success as a jewelry designer. Not only will you save money from not making many common mistakes, but you will certainly increase your profit potential and earn much more at your next show, just from implementing a few of Rena's secret strategies. Rena is an excellent author, and her book is written in a friendly, easy-to-read style. I highly recommend it! Don't wait, if you get your own copy of this great book today you will also receive three special bonus items. Thanks for reading the newsletter this month. 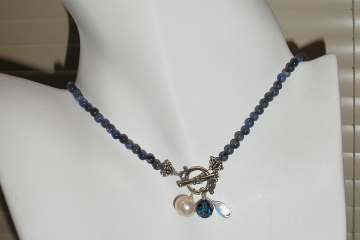 Remember to check www.Making-Jewelry.com often for more “How To’s” and project ideas. We’ve only just begun and there are many exciting things coming on the website. “From inspiration to your creation…” Take care, happy beading, and have a great month! If you're reading this on the recommendation of a friend and would like to receive all the future editions, you can subscribe for free by clicking this link. If you have any comments, opinions, or content ideas I'd love to hear from you. Just click on the this link to access my contact form.